PYRO-ENERGEN : How Does it Work? How exactly the PYRO-ENERGEN works on our body so far can only be accurately explained based on the original theory of the PYRO-ENERGEN inventor, Junji Takano. The PYRO-ENERGEN machine works by enveloping the patient's body with a special electric field made of negatively-charged static electricity. How the machine does this is the inventor's trade secret. When the body is surrounded by this electric field, it creates an environment wherein the cancer cells and viruses cannot reproduce and mutate, and will eventually die. All of this is done miraculously without affecting normal body cells. 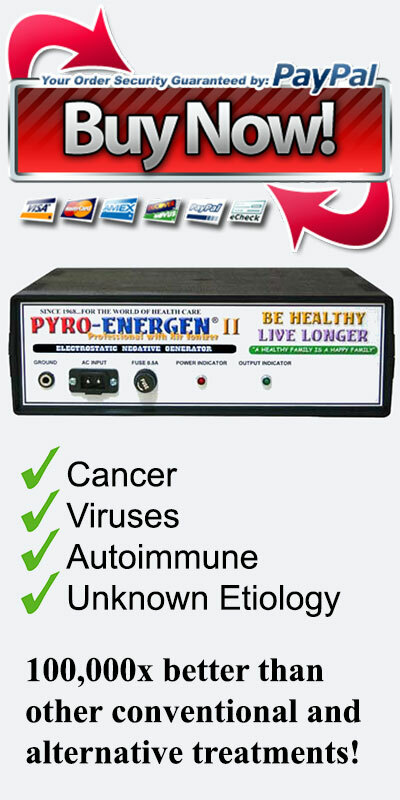 On a healthy individual, the use of PYRO-ENERGEN will prevent cancer cells and viruses from being created. Experiments have shown that cancer viruses can go down to as much as 20-50% in just a week by simply soaking the entire body of negative static electricity. That's already more than 10 times better than some alternative cancer treatments, for which a good program can only go to as far as about 10% reduction a month. That makes the PYRO-ENERGEN method work really fast compared to most orthodox and alternative treatments! What's more, it's 100% safe and with 0% side effects. Now, compare that to high-cost treatments like chemotherapy, which only have an overall 3% success rate. The risk of getting side effects is insanely high and devastating. On top of that, chemotherapy does not cure 96-98% of all cancers and people are more likely to die faster with chemo than without it. All of this makes the PYRO-ENERGEN 100,000 times better than chemotherapy and hundreds of times cheaper. The special electric field the PYRO-ENERGEN emits, which glows continuously around the user's body, interfere with cancer cell division process. In other words, the waves of static electricity affect cell division chromosomes so the tumor cells do not divide and will eventually be destroyed. Cancerous or malignant tumors will also begin to shrink until they disappear. This static electric field emission also damages the virus DNA and its surrounding protein structures making it incapable of replicating and causing infection. These phenomena result to both cancer cell death and virus death. The dead cancer and viral cells will be subsequently decomposed, reabsorbed, and digested by the body's immune system. Another way to say it is this: It is a fact that the most common form of DNA, which is B-DNA, is electrically conductive. Therefore, you can think of virus DNA and cancer cell DNA as "radio" antennas. 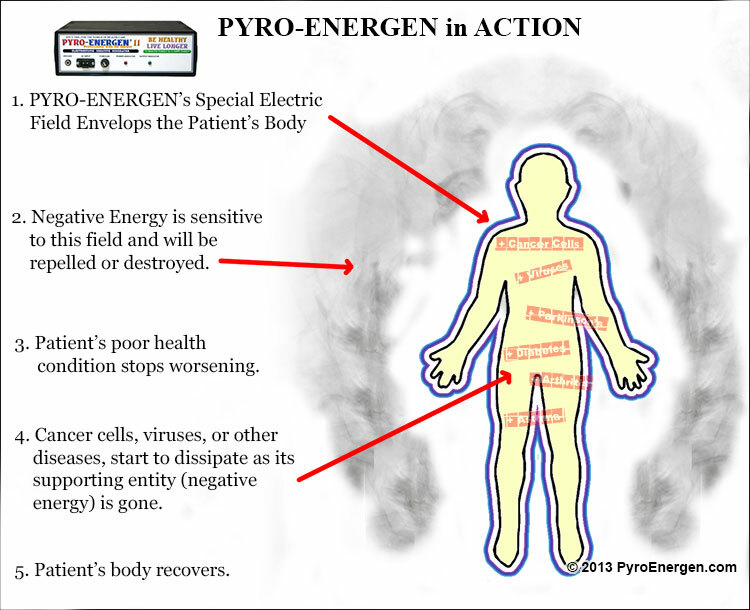 The PYRO-ENERGEN's special electric field emits a signal that interrupts the working of the virus and cancer cell while no harm is done to normal body cells. This is the major reason the PYRO-ENERGEN electrostatic therapy machine is far more superior to chemotherapy and radiation therapy as these conventional methods results in numerous negative side effects as they also target normal body cells leading to their death including making the cancer worse. The earliest recorded medical use of electricity is in 46-47 A.D. when the Roman emperors' physician Scribonius Largus recommended treatment with the electric torpedo fish or electric rays (known for being capable of producing an electric discharge) for rheumatism and gout. Benjamin Franklin used electricity to treat people with neurologic problems. In 18th century, John Wesley in England is also known to use electricity to heal many disorders. Skin rubdown using a dry towel to scrub the whole body also produces static electricity and is a Japanese traditional procedure since hundreds of years ago. Skin rubdown is also known to improve cellular immunity like massage therapy. Visit https://www.pyroenergen.com/history.htm for more information about skin rubdown. In 1968, Junji Takano discovered the root cause of cancer, viruses, and incurable diseases, and found that electricity does not need to penetrate the body, thereby completely eliminating all negative side effects that electrical current penetration and electric shock can cause to the body. The PYRO-ENERGEN is a complete revamp and the most remarkable breakthrough from how electricity was used historically in treating various disorders and diseases. It is by far the only machine in the world that utilizes electricity at its maximum potential and in most effective and safest way. Scientifically speaking, with all information we have cited thus far, including case studies and evidences, the above explanations are theoretically valid. One caveat however, is that there are still many questions that are virtually impossible to explain scientifically simply because the etiology of these diseases is unknown to science in the first place. 1. How the PYRO-ENERGEN works on diseases with an unknown origin or whose cause is unknown? 2. Why exactly are cancer cells and viruses dying when exposed to static electricity? 3. 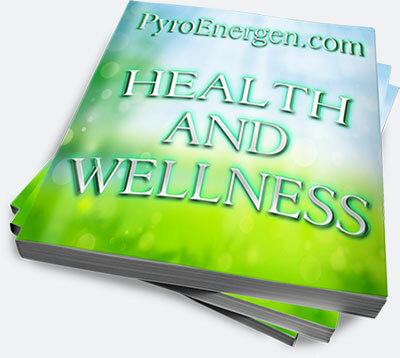 Why the PYRO-ENERGEN won't work on diseases caused by bacteria, fungi, and parasitic worms? 4. Why the PYRO-ENERGEN won't work on occupational cancers, which according to WHO accounts to about 4% of all cancer cases (Asbestos cancer being the most common)? All of the above questions can be answered by disregarding scientific laws and reading how the PYRO-ENERGEN works under a completely different perspective as shown below. After all, there are so many things in the world that science cannot really prove and explain. Note: The statements below are accurately based on findings and discoveries of the Japanese health researcher Junji Takano, which led to his invention of the PYRO-ENERGEN electrostatic therapy machine. You may find that the concept may be analogous with some forms of complementary medicine or energy healing, and even spiritual healing. To heal cancer, viral diseases, and incurable diseases, you must treat the cause and not the effect. Do you know that we are all living under a certain electric field of natural waves? When this kind of field is broken, then you become unhealthy. In today's modern world, there are now various kinds of pollutants and our planet is warming up. All of these build up significant amount of negative energy forces. This negative energy force creates unhealthy conditions–cancer, viruses, and other incurable diseases. So what happens is that nature is losing a perfectly balanced electric field in its atmosphere. We highly recommend that you also read our literature about the root cause of cancer and viral diseases at https://www.pyroenergen.com/causes.htm to grasp a better understanding of this subject. Aside from it, the individual's personal offense against humanity is also losing a certain electric field (something like a human aura in complementary medicine) that protects one's body from these negative energy forces. It happens because of disharmony of the body, mind, and/or spirit occurs. In alternative medicine, they usually call this phenomenon "energy field disturbance". 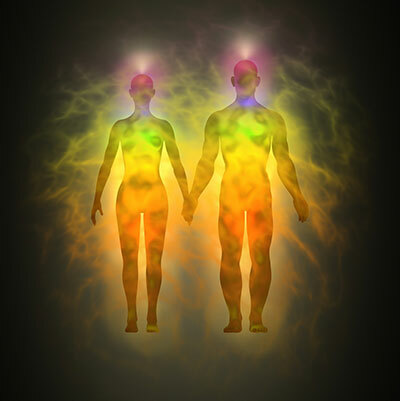 As seen in the above illustrations, our body is surrounded by outside negative energy force that creates diseases. When a user sits on the PYRO-ENERGEN machine, the user's body will be completely covered by negatively-charged static electricity. What the PYRO-ENERGEN machine does is it creates static electrification just outside the body to discharge the negative energy force. Without this outside negative energy, cancer cells and viruses will die, and you'll be free from dreadful diseases. 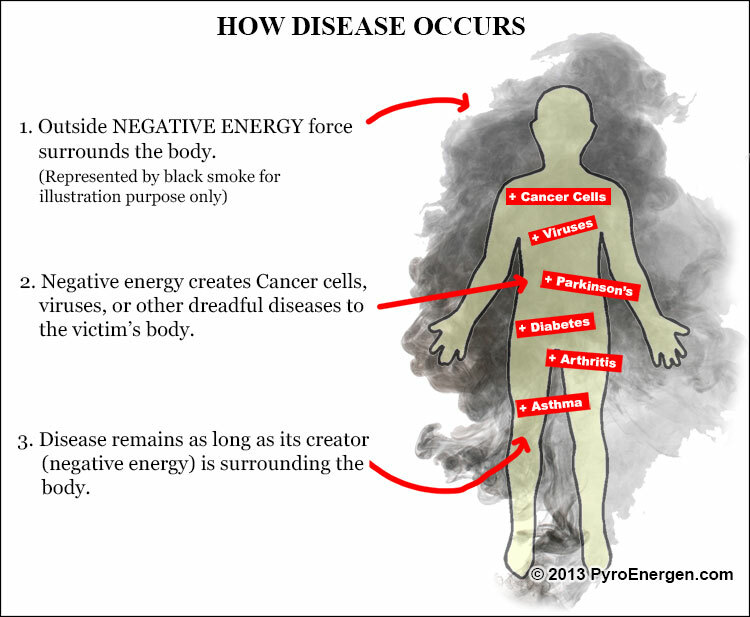 Since this outside negative energy is what creates cancer, viruses, and other incurable diseases, the use of PYRO-ENERGEN even if you are a healthy individual will help prevent the negative energy in creating these diseases in your body. The causation of bacterial diseases, fungal infections, parasitic worm infections, physical injuries and wounds, and occupational cancers are fully understood by science. Meaning to say, these kinds of diseases can be prevented and even be cured. For example, asbestos cancer (mesothelioma) can be prevented by wearing proper protective gears to minimize exposure to asbestos dust. A bacterial disease can be cured either by taking antibiotics or through natural methods to kill the bacteria. On the other hand, how viruses and cancer cells create diseases are much more complex to understand by science since they are extraordinary in their diversity. Bacteria are living organisms while opinions differ on whether viruses are a form of life or not. Bacteria can form fossils while viruses don't, thereby making its origin unclear. Despite many theories, the cause of cancer and origin of viruses remains unknown by science. There are also many chronic and debilitating diseases of which their causal agent remains "unknown", like Parkinson's disease, arthritis, diabetes, and asthma. However, by disregarding scientific laws, you'll get a much clearer answer—the causal agent that is considered "unknown" by science is nothing more than the outside negative energy force itself! That should explain why PYRO-ENERGEN cannot treat diseases caused by bacteria, fungi, and parasitic worms. The PYRO-ENERGEN can only repel or destroy the negative energy force. Bacteria is bacteria and fungi is fungi. They are living life forms and they did not originate from a negative energy. Viruses, cancer, and diseases of unknown cause originated from negative energy force. They are byproducts of the negative energy, for which the PYRO-ENERGEN can effectively remove. In other words, PYRO-ENERGEN does not directly destroy viruses and cancer cells but their very "root cause" that makes them appear and survive. That is why the PYRO-ENERGEN will also prevent you from getting these diseases. Can We Prove Realms Exist Beyond Our Plane or Brane? Now here comes the next bigger question: What exactly is this outside negative energy force made of? Is it measurable by scientific instruments? Unfortunately, there are no scientific instruments existing today that are capable of measuring this negative energy. Recently, however, scientists have discovered a matter that appears to have a close resemblance to the negative energy force. 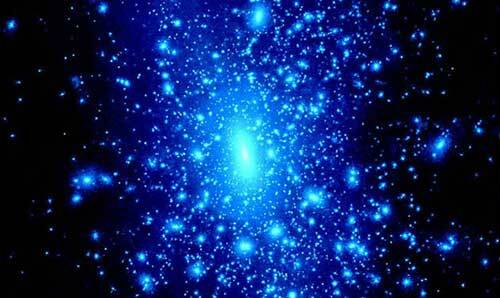 In cosmology, this unknown energy force is called "dark matter" or "dark energy". In physics, scientists are also probing the existence of "fifth dimension". Junji Takano, the PYRO-ENERGEN inventor, cited that the negative energy force resides in this fifth dimension. These major discoveries in science, although hypothetical, prove that this negative energy force really exists in our world and the universe. It is just that science does not have 100% understanding of the universe, and very likely they never will. Also read the article "Negative Energy (Dark Matter/Energy) Resides in 5th Dimension"
The PYRO-ENERGEN technology is not in the world dictionaries. Any existing medical or scientific words simply cannot explain its theory. Scientists and medical scholars are trying to find the root and origin of dreadful diseases. But if you can't find its origins, then how can you possibly find the remedy and cure for these illnesses? Doctors are just trying to apply available drugs and modern medical machines. Antiviral drugs only inhibit the growth of the virus and not destroy it. Treatments like chemotherapy and radiation therapy affects both the cancer cells and normal cells and have very low success rate. Increased malignancy is also very common. Other so-called modern medical machines penetrate the body with electric current or electric shock, which also creates harmful side effects. Many did not believe when Albert Einstein discovered the law of relativity. It is just the same as the PYRO-ENERGEN technology right now. More than 40 years ago, when the inventor of PYRO-ENERGEN, Mr. Takano, discovered the origin of viruses and other mysterious diseases, many refused to believe him. Today, uncountable number of people around the world believes in him. Do you notice that currently active arc welders never suffer from viral diseases? Arc welding produces various signals or waves including waves similar to what PYRO-ENERGEN emits. The arc welding wave can eradicate the outside negative energy force from active arc welders, which again proves the theory of the negative energy. With that said, we advise arc welders to observe proper precautions as welding can be an unhealthy and dangerous practice due to the heat, sparks, and fumes.